Brief Synopsis – A computer programmer gets involved in international espionage when she is recruited via her computer to help a spy trapped on foreign soil. My Take on it – This is a film that I recall seeing on cable as a kid and thought it was quite a clever thriller. 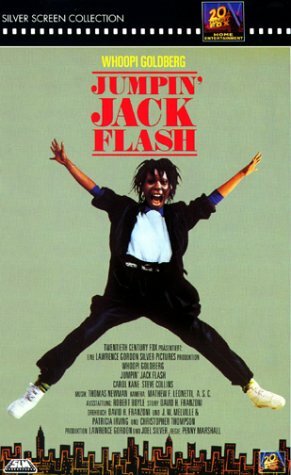 Whoopi Goldberg is quite fun in this film and helps it along a bit despite the fact that the storyline itself is quite bland and gets pretty absurd along the way. The premise of the film tho has been used numerous times much more effectively than they manage to do here which is quite unfortunate. This film’s biggest issue tho is the fact that they aren’t really sure what kind of spy film they are trying to make and the mix of comedy and thrills just don’t mesh well here and this eventually makes the film lose much of its credibility as either of those categories. This was one of the films that helped make the name Whoopi quiet popular but unfortunately, as good of an actress as she can be, in this film she feels like she is in way over her head and completely out of her league. Bottom Line – Goldberg is fun in this film but the overall storyline is quite bland and silly. The premise is an interesting one that has been used more effectively elsewhere. The biggest problem is that they aren’t really sure of they want this story to be more of a thriller or a comedy and things get very lost along the way because of that. Whoopie was pretty unknown at the time that she made this film and it helped make her well known but even she feels way out of her league with this character and storyline.